Island of Cuba. / The Bermudas. or Summer Islands. / Chart of the Bahama Islands. This fascinating hand colored 1816 map by Edinburgh cartographer John Thomson depicts the modern West Indies or Caribbean nations of The Bahamas, Bermuda and Cuba. Divided into three sections, this is a spectacularly detailed map of this regions. Depicts towns and cities, river courses, missions, and topographic features. 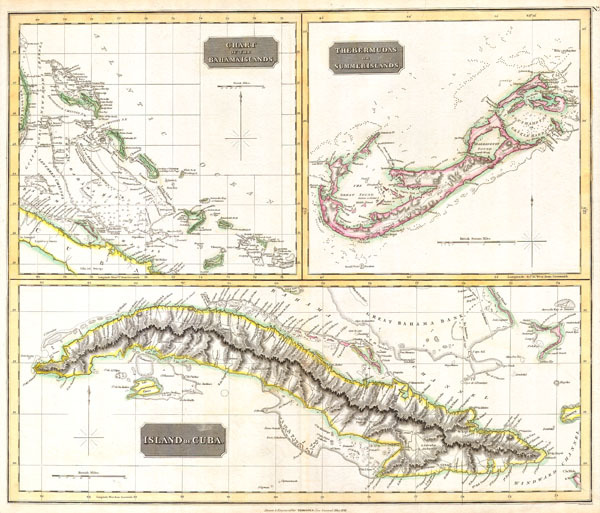 One of the finest maps of these islands to appear in the 19th century. Fine or Perfect condition. Wide clean margins. Original platemark visible. Blank on verso.